The Vicar of Dibley is a British sitcom which originally ran on BBC One from 10 November 1994 to 22 January 1998 (with three sets of specials in the Winters of 1999/2000, 2004/2005 and 2006/2007). It is set in a fictional small Oxfordshire village called Dibley, which is assigned a female vicar following the 1992 changes in the Church of England that permitted the ordination of women. In ratings terms, it is among the most successful British programmes in the digital era, with the various Christmas and New Year specials in 1999, 2004, 2005, 2006 and 2007 all entering the UK top 10 programmes of the year.The Vicar of Dibley received multiple British Comedy Awards (including a Best TV Comedy Actress Award for Emma Chambers), two International Emmys, and was a multiple British Academy Television Awards nominee. In 2004, it placed third in a BBC poll of Britain's Best Sitcom. The series also includes six charity special shorts, for Comic Relief, the most recent in 2015. Pam Rhodes, Kylie Minogue, Rachel Hunter, Terry Wogan, Jeremy Paxman, Martyn Lewis, Darcey Bussell and Sean Bean have each appeared as themselves in one episode. Sarah, Duchess of York, Richard Ayoade, Orla Brady, Fiona Bruce, Annette Crosbie, Johnny Depp, Ruth Jones, Damian Lewis, Maureen Lipman, Jennifer Saunders, Sting, Stephen Tompkinson and Emma Watson have made guest appearances in shorts made for Comic Relief. The series was created by Richard Curtis and written for actress Dawn French by Curtis and Paul Mayhew-Archer, with contributions from Kit Hesketh-Harvey. The main character was an invention of Richard Curtis, but he and Dawn French extensively consulted Joy Carroll, one of the first Anglican female priests, and garnered many character traits and much information. The Vicar of Dibley has had 20 episodes, spanning two series between 1994 and 1998, and ten specials between 1996 and 2007. In addition there have been six short charity specials, between 1997 and 2015. The first series was broadcast on BBC One from 10 November to 15 December 1994, consisting of six episodes. Following the first series, an Easter special and a Christmas special were broadcast in 1996. A four-episode second series was ordered and screened between the 26 December 1997 and 22 January 1998. Subsequent episodes consisted of Christmas and New Year specials, with the four "Seasonal Specials" (in the order Autumn, Winter, Spring, Summer, often referred to as the third series) airing from 24 December 1999 to 1 January 2000, the two-episode "A Very Dibley Christmas" screening between 25 December 2004 and 1 January 2005, and the two-part finale, "A Wholly Holy Happy Ending", which was broadcast during Christmas 2006 and New Year 2007. The final 2006-2007 episode, in which Geraldine marries, was publicised as the "last-ever" episode, although there have been three Comic Relief charity specials since. On 15 March 2013, French reprised her role as Geraldine Granger as part of her French and Saunders marathon on BBC Radio 2. She was interviewed by Chris Evans on his Pause for Thought section. The episodes often begin and end with funny vignettes. In earlier episodes, the opening credits were followed by a humorous village scene, such as a woman knitting directly from a sheep, a man sliding off a thatched roof, or the vicar building a tower of books to amuse Alice's baby. After the closing credits Geraldine usually tells Alice a joke, to which Alice either overreacts, tries to interpret the joke literally, or understands only after Geraldine explains the joke. There are a few exceptions: in "The Window & the Weather" (1994) Alice tells a joke to Geraldine; in "Love and Marriage" (1998) Geraldine tells the joke to David, as Alice is away on her honeymoon; and in "Happy New Year" (2005) the joke is told at the beginning, since the end of the episode focuses on the Make Poverty History campaign. In May 2007, Richard Curtis received a BAFTA Academy Fellowship Award for his humanitarian pursuits as well as his creative work including The Vicar of Dibley. 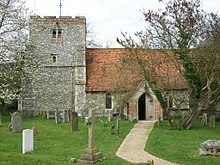 The programme is set in the fictional Oxfordshire village of Dibley; however, some of the villagers, including Alice, Jim and Owen, speak with slight West Country accents, and the series was filmed in the Buckinghamshire village of Turville near High Wycombe, with the village's St Mary the Virgin Church doubling as Dibley's St Barnabus (sic). Other television programmes and films, such as Midsomer Murders, Goodnight Mister Tom, Chitty Chitty Bang Bang, Went the Day Well?, Father Came Too!, Marple, and Foyle's War have also been filmed in the village. 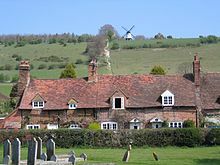 The exterior location for David Horton's manor (usually only seen in establishing shots) was not located in Turville, but in the village of Little Missenden, Buckinghamshire. The opening titles show aerial shots of the M40 motorway's Stokenchurch Gap, the Chiltern Hills of Oxfordshire and Buckinghamshire, and the village of Turville. Only two episodes, "The Window and the Weather" (1994) and "Celebrity Vicar" (1998), plus the 2013 Comic Relief sketch have scenes clearly set in locations outside the village. It is not clear whether other scenes, such as the speed dating session in "Happy New Year" (2005), were meant to be located in the village or not. The theme music was a setting of Psalm 23 composed by Howard Goodall and was performed by the choir of Christ Church Cathedral, Oxford, with George Humphreys singing the solo. The conductor was Stephen Darlington. Goodall originally wrote it as a serious piece of church choral music. It has been released as a charity single with proceeds to Comic Relief. It also appears on Goodall's CD Choral Works, which also includes his theme for another popular comedy, Mr. Bean - and coincidentally a snippet of The Vicar of Dibley's theme music was used in Mr. Bean episode Tee Off, Mr. Bean. The Vicar of Dibley was released in DVD in Region 2 (UK) from 2001. In 2002, a DVD entitled The Best of The Vicar of Dibley was released featuring a 90-minute film of Dawn French talking to the producer, Jon Plowman, with clips from the series. A 2002 documentary narrated by Jo Brand, entitled The Real Vicars of Dibley, was also on the DVD. In 2005, a boxset of the "complete collection" was released. This included all the then aired episodes and shorts except the 1997 BallyKissDibley Comic Relief short. The final two episodes and 6-disc "ultimate" box set were released on 26 November 2007, although neither included the 2007 Comic Relief short or BallyKissDibley. In Australia (Region 4), all episodes have been released on DVD, but the 2007 Comic Relief short episode, "Wife Swap", has only been released on a Comic Relief DVD called Now That's What I Call Comedy, having become difficult to find. In the United States and Canada (Region 1), all episodes have been released on DVD. The seasonal specials are often referred to as "Series 3". This is not a series, and was not released as such on VHS or DVD in the UK. In the United States, the four specials were released as "Series 3". In February 2016 it was reported that Dawn French was interested in returning to the role as "The Bishop Of Dibley", to follow on from the 2015 Red Nose Day Special. The idea for a US version of the show came about when two co-stars of the American sitcom Frasier, Jane Leeves and Peri Gilpin, set up their production company Bristol Cities with an American version of The Vicar of Dibley as their first project. On 6 February 2007, Fox announced plans to adapt The Vicar of Dibley into an American sitcom, titled The Minister of Divine. The series starred Kirstie Alley as a former "Wild Child" who returned to her hometown as its first female minister. The series was not picked up by Fox for its 2007–2008 schedule. ^ Joy Carroll (September 2002). Beneath the Cassock: The Real-life Vicar of Dibley. HarperCollins. ISBN 0-00-712207-1. ^ "Dibley's farewell is ratings hit". London: BBC. 2 January 2007. ^ "Entertainment | Emmy success for Vicar of Dibley". BBC News. 24 November 1998. Retrieved 27 April 2011. ^ "French, Dawn (1957–) Biography". BFI Screenonline. Retrieved 27 April 2011. ^ Briant, Fiona (3 November 2004). "Vicar back for more worship". The Sun. Retrieved 27 April 2011. ^ Thomas, Archie (18 May 2007). "British acad to honor Curtis – Scribe wrote 'Vicar of Dibley, ' 'Girl in the Cafe'". Variety. Retrieved 21 May 2007. ^ "ABC Classic FM Music Details: Saturday 10 June 2000". Australian Broadcasting Corporation. Retrieved 27 April 2011. ^ "The Vicar of Dibley - The Specials". Amazon.co.uk. Retrieved 27 November 2016. ^ Simon Cable (14 February 2016). "Vicar of Dibley set for TV comeback - but with one very big change - Mirror Online". Mirror.co.uk. Retrieved 27 November 2016. ^ "Pilots: FOX 'Minister' Role Up Kirstie's Alley". Zap2it.com. Retrieved 6 February 2007.